Each Case contains (6) 5 pound cans of Hard White Wheat Berries. 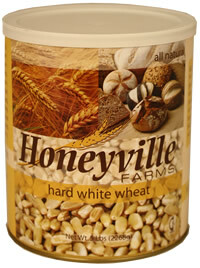 Each #10 Can contains 5 pounds of Honeyville's Hard White Wheat Berries. Honeyville's Hard White Winter Wheat comes from specially selected varieties of winter wheat known for its storage and baking qualities. Low in moisture, high in protein, Honeyville Grain, Inc. guarantees our Hard White Wheat to be below 10% in moisture and higher than 12% protein. Ideal for long-term storage, Honeyville's special triple cleaning process produces the highest quality Hard White Wheat available to consumers for long-term storage. Our wheat products are milled and processed exclusively at our Honeyville milling facilities to the Table-Grade quality standards established by the state of Utah. Honeyville's Hard White Wheat Berries are sealed in an airtight #10 can with an oxygen absorber for optimal storage life and freshness. Hard White Wheat will store in the sealed can for 10 to 15 years under ideal storage conditions.